Nuclear Information and Resource Service is a 501(c)(3) organization. 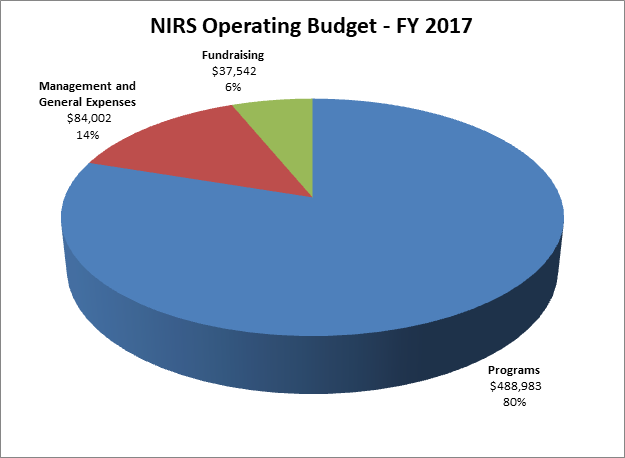 All contributions to NIRS are tax-deductible and are greatly appreciated. NIRS prides itself on running a lean, effective operation in compliance with all relevant laws and best practices. For fiscal year 2012 (February 2, 2012-January 31, 2013), our certified financial audit showed that 84% of all contributions were spent directly for our program work. Administrative costs were at 11% and fundraising costs were about 5%. Our ratios have been similar over the years. Our 2014 operating budget (February 1, 2014—January 31, 2015) is $734,500. About 40% of our funds are expected to come from foundations; tax-deductible contributions from individuals and small businesses are needed to provide the rest. We rely upon the generosity and support of people across the country to maintain our effectiveness, outreach and necessary services to grassroots activists everywhere. We can’t do it without you—we know that and we gratefully appreciate every donation, large or small. Donations may be made for general support for NIRS, or directed to a specific project/campaign. Project proposals are available to interested funders (including individual donors). New projects and proposals arise as necessary. Many of our projects/campaigns are collaborative efforts with other organizations. Suggestions for projects/campaigns are welcome. Please contact Tim Judson, Executive Director, timj@nirs.org, 301-270-6477 for more information about funding proposals and NIRS projects/campaigns. Our FY 2017 audited financial statement is available here. Our 2017 Form 990 filing with the Internal Revenue Service is available here. Our FY 2016 audited financial statement is available here. Our 2016 Form 990 filing with the Internal Revenue Service is available here. Our FY 2015 audited financial statement is available here. Our 2015 Form 990 filing with the Internal Revenue Service is available here. Our FY 2014 audited financial statement is available here. Our FY 2013 audited financial statement is available here. Our 2013 Form 990 filing with the Internal Revenue Service is available here. Our FY 2012 audited financial statement is available here. Our 2012 Form 990 filing with the Internal Revenue Service is available here. Our FY 2011 audited financial statement is available here. Our 2011 Form 990 filing with the Internal Revenue Service is available here. Our FY 2010 audited financial statement is available here. Our 2010 Form 990 filing with the Internal Revenue Service is available here. Our FY 2009 audited financial statement is available here. Our 2009 Form 990 filing with the Internal Revenue Service is available here. Our FY 2008 audited financial statement is available here. Our 2008 Form 990 filing with the Internal Revenue Service is available here. Every donation to NIRS, of any size, is gratefully appreciated. Our members and supporters make our work possible. We would like to recognize and publicly thank those who have been able to provide substantial support for NIRS. Your contributions have been both generous and essential in making NIRS the highly effective and rapidly growing organization that it is. Here is a list of NIRS’ large donors over the past five years ($10,000 or more during this period), in no particular order.